Homemade marshmallows are already light and fluffy, so why not take advantage of their texture and turn them into literal Marshmallow Clouds? I love these plush clouds, made of fluffy homemade vanilla marshmallows. You can flavor them however you'd like, and make them in size ranging from 2-bite clouds to giant, size-of-your-hand beauties! To make these even more fun, you can add rainbows made of brightly colored licorice. This is optional, but it makes the marshmallow clouds pop, and it makes these the perfect dessert for a rainbow party of St. Patrick's Day party! 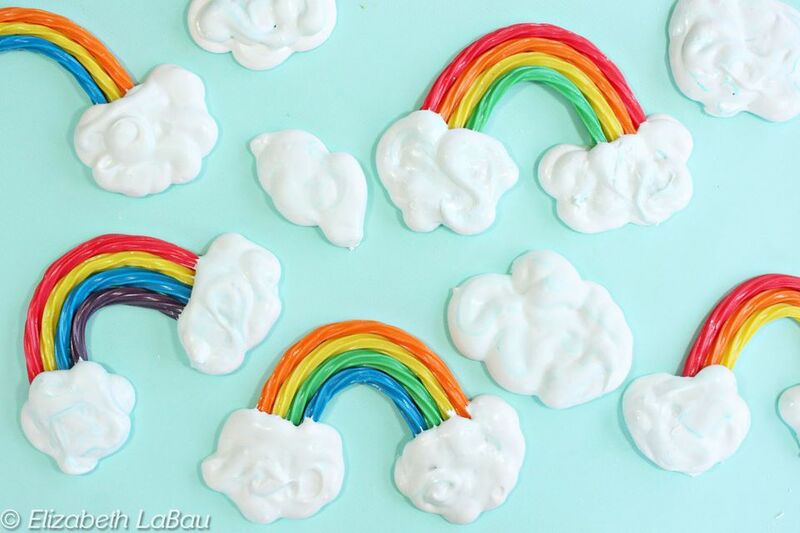 You can also skip the rainbow licorice and just make marshmallow clouds with this recipe. This recipe yields about 20 large clouds (4-5") or about 10 full rainbows with clouds. The exact amount you get out of it will depend on the size of your clouds. Cover 2-3 baking sheets with parchment paper or waxed paper, and spray them lightly with nonstick cooking spray. Place the white chocolate chips in a small bowl and melt them in the microwave in 30-second increments, stirring frequently, until melted and smooth. Transfer the melted white chocolate to a paper cone or plastic bag with a hole snipped in the corner. Arrange the licorice in 10 rainbow shapes. Use 3-4 pieces of licorice for each rainbow, for best results. Pipe a thick line of melted chocolate across the backs of the licorice strands at the bottom of one side, to glue them together. Don't worry if the bottoms of the strands don't line, up, you can trim those later. Do one side of each rainbow, then refrigerate the tray to let the chocolate set for 5-10 minutes. Re-warm the bag of melted chocolate, then pipe a thick line of melted chocolate across the bottom of the other side of the rainbow, holding them together with your hands if necessary. Refrigerate the tray again, and once the white chocolate is set, trim the bottoms of the licorice strands so they're roughly even. (It will be covered by marshmallow, so it's not too important to be precise!) Finally, flip the licorice rainbows over so the white chocolate strips are hidden on the back. Next, make the marshmallows. Pour 1/2 cup cold water into the bowl of a large stand mixer fitted with a whisk attachment. Stir the water gently with a small whisk or fork, and while stirring sprinkle the gelatin on top until it is all mixed in. Let sit for at least 5-10 minutes for the gelatin to "bloom," or hydrate and absorb the water. Pour the remaining 1/2 cup of water into a medium saucepan and add the corn syrup, granulated sugar, and salt. Place the pan over medium heat and stir while the sugar dissolves. Brush down the sides of the pan occasionally with a wet pastry brush to remove any sugar crystals. When the mixture comes to a boil, stop stirring and insert a candy thermometer. Cook the sugar syrup until it reaches 248 F on the candy thermometer. Once at 248 F, remove the pan from the heat. Turn the mixer to low and slowly stream the hot sugar syrup into the gelatin, aiming to pour it between the whisk blades and the sides of the bowl, so it doesn't splatter all over the bowl. Once all of the sugar syrup is added, gradually increase the mixer speed to medium-high. Whip the marshmallow for about 7 minutes, until it is a glossy white color and is very thick, and drops from the whisk in a very slow ribbon. Add the vanilla extract and whip it in for another 15-20 seconds. Fit a piping bag with a large round tip (at least 1/2-inch wide) or a coupler. If you want blue streaks in your marshmallow clouds, paint a thin, faint line of blue food coloring up the inside of the piping bag. This step is optional but it adds some fun dimension to the clouds. Fill the pastry bag with marshmallow about three-quarters full, and twist it at the top. Pipe blobs and swirls of marshmallow at the base of the rainbows, overlapping the bottoms so the marshmallow clings to the licorice. There's really no wrong way to make these clouds—experiment with swirling the marshmallow around on top of itself, make circles or scrolls, or just zig-zag the pastry bag to make fluffy cloud shapes. When your bag runs low, fill it up with more marshmallow and repeat until you've used up all the marshmallow mixture. It's important to work quickly when doing this, as the marshmallow mixture will start to set over time, and if you wait too long, you'll have a hard time forming your cloud shapes. If you want to try some clouds without rainbows, just pipe them free-form on the baking sheets. Once all of your marshmallow mixture is used up, let the trays set at room temperature overnight to firm up the marshmallow. Once the marshmallow is set, lightly dust the bottoms with powdered sugar so it's not sticky, and you're ready to serve them! These marshmallows are best enjoyed within several days of making them, as both the licorice rainbows and marshmallows tend to get stale over time when exposed to air. Store extras in an airtight container at room temperature, separated by layers of waxed paper or parchment. Click Here to View All St. Patrick's Day Candy Recipes!